Habitat: Venezuela. Cattleya lueddemanniana is native to the northern Coastal Ranges (west of Caracas) in scrubby hillside vegetation between sea level and 500 meters. Plant Size: Cattleya lueddemanniana us a medium-sized unifoliate cattleya. The plant has one large, leathery leaf on top of cylindrical, compressed pseudobulb that grow to 6 inches (25 cm) in height. Flowers are formed on new growths and flower as the pseudobulb matures. Flower Description: Strongly fragrant. The 4 inch (10 cm) flower spike has between 2 to 5 flowers. The flower color is highly variable. Most individuals have medium rose-purple flowers. Sometimes, dark pink, white, coerulea and semi-alba forms are available. The lip is rose-purple with yellow or cream-colored with dark markings. Flowers last 2-3 weeks. Flowers of Cattleya lueddemanniana have good form and shape. Bloom Season: Spring (sometimes in the Fall). Flowers the same time as Cattleya mossiae. Growing Temperature: Warm to Hot. Minimum nighttime temperatures should not fall below 60 F. Seedlings need warmer temperatures to thrive. 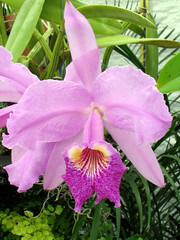 Additional Information: Cattleya lueddemanniana is another classic corsage orchid. Grow with very high levels of light and provide plenty of air circulation. When properly grown, the foliage is light green. Growth begins in the winter and flowers in April or May in the United States. Sometimes, a second growth is produced after flowering, but this one is usually "blind" and does not produce flowers. Ample water and fertilizer are required when actively growing. Let the plant dry out between waterings and do not fertilize when not actively growing. It grows well under intermediate conditions and is a good species for beginners. In nature, it hybridizes with Cattleya mossiae to form Cattleya x gravesiana.